Midway Chrysler Dodge Jeep Ram is a full line Chrysler dealership located in Central Nebraska in Kearney. 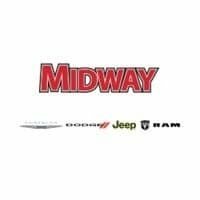 Midway Chrysler Dodge Jeep Ram carries a huge selection of new Chrysler, Dodge, Jeep and Ram trucks along with a huge inventory of used vehicles. With a large selection, we are sure you will find just the right car, pickup truck or SUV for you. Midway Chrysler Dodge Jeep Ram also provides Certified Pre-owned vehicles with extended warranties, a 30-day exchange privilege and free car washes for life! We’re happy to not only provide one of the widest inventory selections to our Grand Island, Lexington, Holdrege, and Hastings neighbors but also a top-notch certified staff to help care of your vehicle. Our mission is to make every customer a customer for life. Our commitment to our customers extends far beyond the sale. Come into our convenient Service Center, Collision Center, and Parts Department in Kearney, Nebraska for high-quality service by trained professionals. Located in Kearney – between Grand Island and North Platte, we’re confident you’ll have the hassle-free car buying experience you’re looking for at Midway Chrysler Dodge Jeep Ram. We look forward to serving you! Reach us online or by phone at (888) 715-0722.